According to my sources, DC Mayor Vincent Gray (D) on Monday will meet with members of the Deanwood Citizens Association who are outraged over the shooting death of Akinwole Olu Williams, 31, killed on Thursday of last week, near midnight, while walking the short distance from the Deanwood Metro Station to his home. Williams, who recently completed his bachelor’s degree studies at CatholicUniversity, was considering law school and, meanwhile, worked at Comfort One Shoes, near Dupont Circle in NW DC. Deanwood community activists and citizens at large are saying, “it’s enough!” and have secured a commitment from Gray to meet with them on Monday (March 25, at 6:30 p.m.) at the Deanwood Recreation Center at 1350 49th Street, NE to discuss the violence in that community and conditions which they believe are untenable to the peace and stability of the neighborhood. Adrienne Loftin, an HR executive and Deanwood property owner who has deep family roots in the community and whose daughter, a 21-year Howard University student, lives a short distance from where Williams was murdered, says this apparently senseless killing is a late wake-up call to the community and the mayor’s office. “We want more police patrols, new bright lighting, clean streets and enforcement of housing codes to eliminate dilapidated, vacant homes,” said Loftin. “Two years ago, another CatholicUniversity student was killed in the Sherman Circle Community in NW and as a result of that community taking a stand, with the support of DC Government officials, that community is now safer than it’s ever been,” she continued. “New street lighting has been installed there, the streets and sidewalks have been cleared of debris and now there are more police officers patrolling the streets,” Loftin added. “As taxpayers, we want the same consideration. People need to come out on Monday night, in good numbers, and talk to the mayor, face-to-face; and we want the press there too, to record the conversation,” said Loftin. “We will not just sit by and allow Deanwood residents to continue to be the victims of violence and neglect. Mr. Williams’ tragic death—and I’ll be frank—and my own daughter’s proximity to it makes it clear to me that we can wait no longer to take action,” she added. “As a parent of a college student, who will graduate this year, this is unimaginable, unacceptable, and we expect full support and decisive action from Mayor Gray and the DC government to help us rid this neighborhood of undesirables—both, violent criminals and unhealthy conditions,” Loftin continued. A CatholicUniversity spokesperson, said the school will invite Williams’ parents to their May commencement exercises and present his diploma to them. DC Police are offering a reward of up to $25,000 to anyone who provides information leading to the arrest and conviction of the person or persons wanted for this homicide. If you have information, please call 202-727-9099. 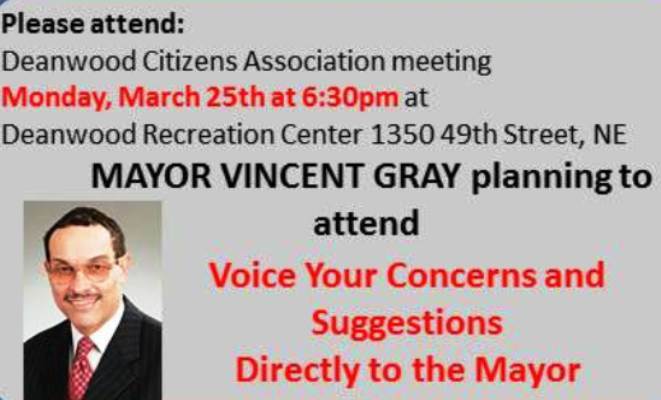 Note: For more information about the Monday meeting with Mayor Gray, contact Adrienne Loftin at 301-706-9390. By the way, I met my wife literally one street over from where this shooting took place, in the Deanwood neighborhood where she grew up (a nice neighborhood of mostly home owners), I lived and we were married. The least I could do for the “old neighbor” was write this piece, circulate it, and ask that if you live in DC, the epidemic of violence is not limited to the Deanwood area, so let’s take a stand and make this meeting with the mayor on Monday night standing room only! This entry was posted in Gun Control, Jesus, NRA, Politics, Second Amendment and tagged Akinwole Olu Williams, Vincent Gray. Bookmark the permalink. Hopefully the criminal will be arrested and convicted. I bet the people in the Deanwood community could have predicted such an event. It’s sad when leadership reacts to tragedy instead of taking action to prevent it. I hope and pray for the changes needed to make Deanwood a safe neighborhood.